Before I got pregnant cleaning was pretty easy. I usually kept a clean house and enjoyed having it that way. During my fourth through nine months I had PGP (you can read about it here) and cleaning became very difficult. Yet, I still managed it for the most part. Then came the newborn stage and, minus the piles of laundry that sometimes accumulated, the house was still pretty tidy. Then my son started walking… and I’ll be honest…I’m not sure my house will ever be clean for more than a few minutes again. He is a Curious George, Dennis the Mennis, and a Tasmanian Devil wrapped into one adorably cute 14 month old. So here are 5 reasons you can be proud of a messy house. 1- You cooked dinner for the family. 2- Instead of spending all day or even 3 full hours cleaning and scrubbing, you spent them playing with your kids. I’ll probably never forget a blog post I read about how to clean up quick before company comes over. In the comments one lady wrote, “It’s easy, I have kids and my house is always clean. Five words: Just KEEP your house clean!” Another lady replied, “Do you not ever take time to play with your kids? If so, how do you manage both?” And I truly wonder that too. Unless you have a cleaning lady (which I’m not opposed to) or kids who are old enough and DO clean up after themselves, it’s pretty much impossible to be both parent and house cleaner 100% of the time. So next time you have finger paints smeared all over your table, or books all over the floor, look at the mess and be proud that you are a hands-on parent; you take time to make memories and even messes with your kids and they love you for it. Yikes. On one hand they are sooo fun but on the other hand they are tons and tons of work. Not to mention the aftermath of catching up, getting back into the routine, unpacking, and cleaning up the car and house. Despite all of that, I can say without hesitation that as a kid I LOVED our family vacations! We all got to know each other better, experienced new things, got out of the monotony of daily life and had a blast. If a mess is the result of bonding, having fun, and spending quality time together, you should surely be proud of it. 4- Company came to stay. I just had visitors come from New Zealand. They are some of the most wonderful people I’ve met. It had been 10 years and we still were just so happy to see each other and visit. I didn’t have a huge mess as a result of their coming, I just didn’t have those days to do the day-to-day cleaning, laundry, etc. Well, the next few days while catching up I was happy because I got to spend such a wonderful couple days with people I just adore. If you invite company over or take time off to make memories with friends, that’s a great reason to be proud of a messy home. Yes, you can even be proud of not cleaning simply because you are burnt out. What did you do to get burnt out? Was it learning, serving, helping, teaching, parenting, exercising, providing, etc.? Or perhaps you are just doing good to get through the day because you are sick, in pain, or have a chronic illness. Maybe its just that you’ve cleaned up the same area multiple times that day and can’t bring yourself to do it again. My friend told me that, “Cleaning a house with little kids is like trying to shovel a sidewalk while its snowing.” If you are too tired to clean, take a rest, recharge your batteries and don’t beat yourself up about it. Life is tough and beating yourself up for a messy house just makes it tougher. While I prefer a clean house and enjoy living in one, when I realized that the mess we make while LIVING our lives was making my attitude worse, I thought up these 5 reasons. Whenever you are tempted to look at a messy house in guilt or disgust, lift your head up high and be proud of the good you are doing rather than counting the messes that need cleaning. I must be the proudest person on my street. I sometimes complain I can’t keep up, but my frends (who have a spotless house at all times) says at least my kids have fun & are happy. Guess its kind of true! Carissa- Yeah kids who have fun and are happy is a great accomplishment. Sounds like you are a wonderful mom! I need to get there and be okay with a messy house! I am getting better with it. Love the giveaway you have going on now! Teresa- Thanks for this kind comment! Yeah it is the process and not the product 🙂 I like how simplistically you said that. Anita, you are so right. I wish there were blogs like this when I was raising my kids. I was blessed to stay home with my 3 kids, now 25, 23 and 20. I, too, often felt ashamed at the state of my home as compared to most of my friends. But as they grew up and would visit their friends houses for sleepovers, they would come home and say, “There’s no food in the house. They never cook.” I still have spots of bright blue paint adhered to the grout in our LR as a reminder of my youngest daughter and her friends painting giant posters for Spirit Week and having a blast. These activities were always at our house because we had the closet full of art supplies and would actually let them use them! 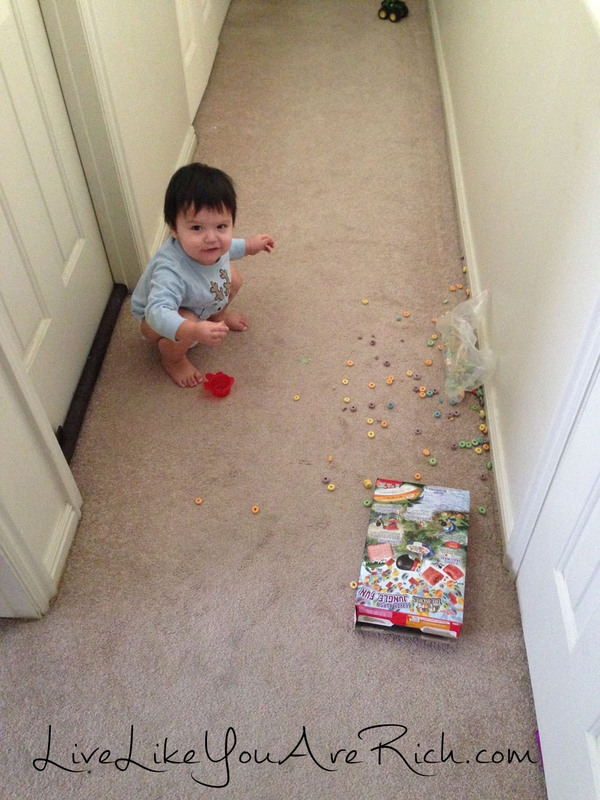 BTW I have a nearly identical photo of my son with an upended box of Cheerios, and it’s one of my favorites! I wouldn’t trade those 25 years of good memories for the perfect house. Teresa- Thanks for the comment, its great to hear from a mother who chose to play and do projects with her children! It’s so fun that your kids and their friends wanted to be at your home because you allowed them to be kids. Thanks again. I like the idea that the mess indicates that other good things are going/have gone on and we can release the desire for perfection! Such a healthy perspective when we often fall into the trap of wanting our lives to look “just so.” I thought you might like to know, too, that “cleanliness is next to godliness” might be on Dr. Bronner’s soap containers but is NOT in the Bible–pressure’s off! Just let the little children come and do their thing. Maria- Thanks! another reader pointed that out too. I’ve always heard it growing up (my mom quoted it a lot) I guess I just thought it was a biblical phrase. I should’ve checked that first :). I did find out that it is a Hebrew saying though 🙂 Thanks for the comment. I’m sorry but I can’t tell you how frustrated I am hearing over and over that the way to be a good mom is to have a messy house. I know the intentions are good with these types of articles and various quotes, but I try very hard to teach my children that they should learn to pick up after themselves and we all help as a family. I spend my evenings after the kids go to bed making sure my house is picked up, dishes are done and that my house is in order. It also isn’t a bad thing that my son comes home from Preschool and excitedly asks if he can unload the dishwasher with me. Small messes with playdoh or legos is one thing, mothers that justify the failure to do the dishes, sweep the floor for weeks at a time or actually wash, fold and put away laundry is what drives me crazy. All over social media sites mother’s love to post what a great mom they are because their house is messy, but the last thing I want is for my children to have memories of rarely seeing a vacuum or not knowing how to clean because playing with cars was much more important than learning responsibility. I know this is not what this article is conveying so please don’t confuse what I’m saying. I just think it is ridiculous that there are some mother’s and father’s that are quick to post those quotes or put that quote on their front room wall in vinyl because somehow that makes them feel better for their lack of responsibility. I think children in this generation have no clue how to clean. I manage an apartment complex of 200+ single college students and I can’t tell you how many of them have no clue what a garbage disposal is, how to use a vacuum, or even how to clean a window. Some of them are annoyed that we don’t have a weekly cleaning service to clean their apartment. This is really sad to me that our society feels that children should just “play” all day every day and not have responsibility, and heaven forbid they actually use an iPad once in a while for educational purposes or a few minutes of a game for pleasure. Being a mother is hard enough as it is, I wish we would all cut each other some slack and quit making each other feel like the other is a bad mom because they do or don’t do something we think they should. If I want my house clean because it helps the environment of my home I shouldn’t be told I’m not “building memories” with my kids because I have a clean house. I would love for there to be a quote that mentions how great it is to be a mom with or without a clean house. End or rant. L22- I agree kids should help clean. I had lots and lots of chores to do everyday when I was little. But when kids are 1-3 its pretty hard to always clean up their messes when they are making them faster than you can clean them. Either way women shouldn’t be judging women. I only wrote this because I was trying myself to let go of having a perfectly clean household with a toddler that messes it up every second. I spend hours cleaning and its still messy (not crazy messy, but not tidy like it used to be before he began walking). Once kids are old enough to help than great they need to be learning a work ethic. I hope I don’t come across here as saying let it go, don’t teach your kids to clean and live in a pig sty… Your opinion is welcome but Personally, I’ve been inundated with cleaning tips, how to keep a house clean etc. It makes me feel like this side of enjoying life and embracing children and that they are untidy is not being told. My house was pretty much spotless when my company came and I do keep it pretty tidy but obsessing over it all day long is and feeling guilty for it when its messy is what I’m trying to learn how to not do. You know, I don’t know why anyone would want to solely focus on teaching their children responsibility over play cars. Both are equally important. This article isn’t saying its okay to be messy and completely neglectful of our houses in order to have happier kids. Its saying that we should love and enjoy our children and teach them by being with them and enjoying them. Teaching them to use their imagine and to develop their creative side. Sure you could fill all your time with them with chores and teaching them responsibility, but if you want well rounded kids who are not robots, you have to know that sometimes having a clean house isn’t everything and its okay to have a messy house. I know if I let my daughter who is 4 help with chores then it usually takes more time then if I just do it myself. I choose to include her because I love her, even though doing so may mean my house isn’t clean at the end of the day. We color, do projects, cook, and play all day. I have my hands full with a newborn, I have homework out the ears, and I choose to play with my family and focus on living life. So yea, you know what sometimes all that fun piles up and while some cleaning gets down it never seems like I am able to catch up to the mess that occurs because of just living. The good moms keeps their house a healthy mess. They don’t neglect cleaning or teaching their children to do so. They just realize there are other ways to teach their children responsibility. They realize children have to have fun and good parents don’t want to miss out on their children’s lives because having a clean house was more important. Responsibility can be taught in many ways and doing many other things besides chores. Maybe I’m wrong, but I want to teach my child that their is so much more beyond her doorstep and that material things are not the only thing that matters. It is okay to let your hair down, step out of your comfort zone, and its okay to make a mess. Life is messy. I completely agree!! My comment wasn’t aimed at you I’m sorry I came across that way, I think I am more frustrated with quotes and pins saying “good moms have messy floors, laundry piles, dust bunnies and happy kids” or sayings like those. That is really frustrating as a mom because our work is never done. Even after the kids go to bed. To stereotype that a “good mom” has a messy house because that means she has “happy kids” is, in my opinion insulting. I have two little ones under the age of 5 and keeping the house clean is a never ending battle, but that doesn’t mean I don’t try and I think there are a lot of mom’s that use the excuse of “what’s the point because it is just going to get dirty again anyway”. Of course it is, but that doesn’t mean you leave scrambled eggs on the kitchen floor for days at a time or even several hours at a time just because kids are going to drop food again. I totally agree that I’m doing exactly what I want people to stop doing and that is judging each other as mothers. If I or others want to keep picking up the same box of cars 10 times a day that’s my choice and Those who choose to let them destroy the house because eventually they will clean it should be able to do that too if they choose. I’m just tired of seeing quotes and people tooting their own horn on FB or Pinterest that they are one of the “good moms” because they have the messy floors and piles of laundry. I get those too, but they don’t make me feel like a good mom. I feel like a good mom when my child is respectful and helps pick up toys at his friends house after a play date because he was taught to clean up after himself. I agree with you, learning to “let it go” and not stressing about it is hard and some days impossible for me but I know that children make messes and the house may never look the way I would like again or at least until they are much older. Again, my comment was not aimed at you, more of a vent to comments in cyber space about what a “good mom” is. L22- No worries I know, you clearly stated you were tired of all the messy house brags. I understand that. personally, as mentioned in the article I love a clean home. It’s just that often women look at the mess and take it personally, feel inadequate, or feel guilty (at least that’s what I often do) which is what inspired me to right this in the first place. Thanks for your comment. You may enjoy and agree with this article I wrote about why women shouldn’t judge other women. It has been so long since I had a clean house. I have raised 8 children and now have 18 grandchildren that visit frequently. I use to be obsessively clean but have learned that the time spent with the children and grandchildren is so precious–so things are just going to have to stay a little messed up, a little dirty, and definitely out of order. Cheryl- Yes 8 kids and 18 grandkids is a lot of fun and joy but I’m sure its tough to stay tidy and clean! I have trouble with 1 son!! I know when we all get together at my mom’s with all our kids (she has 11 grandkids now) its not 40 minutes until the house is a disaster. The kids have soooo much fun though getting out all the toys and running around. I always feel bad when we leave because its usually late and we have to get out of there before our kids get too cranky. We try to help clean up a little but its never clean like it was before we came. But she loves having us all over. Family is what brings joy in life.Thanks for your comment! I am with L22 but my comment will be shorter bc she said most of what I would say. I even wrote a post about this as well. I am a neat freak but I also play with my kids. Everyone is different, if we were all the same, it would be a boring place. Boy, that was a boring comment but I think you get where I am coming from. I won’t judge you, you won’t judge me, deal? You’re welcome! 🙂 so cute. Maintaining a clean house gives you more time with your children, not less. If you wait to clean something until it’s really dirty then you have to spend more time cleaning it. Cleaning the dishes after you use them is far easier and takes less time than scrubbing two-day old food off a sink full of dishes. If you spend fifteen minutes a day wiping down your bathroom and giving your toilet and shower a quick scrub, then you never need to waste a perfectly good Saturday afternoon deep cleaning everything. I used to think cleaning was some kind of drudgery because I never cleaned anything until it was dirty or really needed to be done. Once I started a daily task list and began doing chores right away I realized maintaining a clean house is one of the easiest things in the world, and it saved me a lot of time to spend with my kids and on hobbies I like. It’s a bit difficult at first because you’re in the habit of being lazy and putting things off, but once you get used to it you realize that all the time you spent putting things off you were actually making your life much harder than it needed to be. Nariteaa, Exactly! I used to be awful at housecleaning, like eww… We moved a bit ago and had to go through a lot of stuff. and when we got to the new house, I promised myself AND the Family that I would stay on top of things. Let’s just say three years later, and I have WAY more free time then before AND my chores are done! 🙂 I LOVE it, the kids LOVE it, and the husband LOVES it! Once when my sons were little I was cleaning (rare LOL) and the oldest asked me who was coming over, it shook me! Did the house only get clean when there was company? Was my own Family not worthy of my full efforts, but company was? It spurred me to be BETTER! for my little Family!